The Series: UNT leads 6-5 with FAU taking the regular season meeting in record fashion. 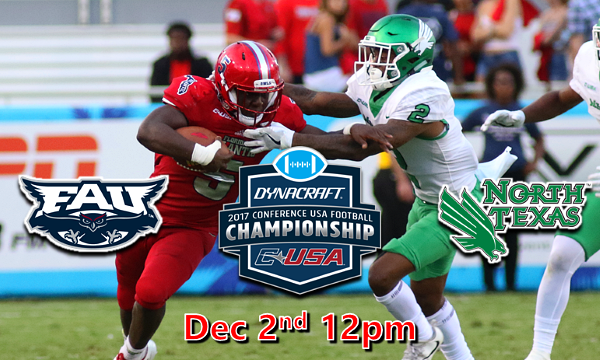 Just two years after finishing 1-11, the Mean Green will make their first C-USA title game appearance under second-year head coach Seth Litrell. North Texas is seeking its first conference championship since winning four straight Sun Belt titles from 2001-04. The Mean Green have defeated every C-USA team they have faced except for FAU, posting a perfect 4-0 home record and earning road wins at Louisiana Tech and Southern Miss. North Texas ranks second in Conference USA in scoring offense at 37.5 points per game. The Mean Green have scored 43 or more points in six of its eight victories. Picked in the preseason to finish fifth in the East Division, Lane Kiffin has led the Owls to a perfect 8-0 mark in Conference USA games and an 9-3 mark overall in his first season at FAU. Florida Atlantic’s current eight-game winning streak is the school’s longest since moving to the FBS level in 2005 and the none wins is the most for the most since becoming an FBS member. Although quiet against Charlotte, FAU senior WR Kalib Woods has been a force in the last two outings, posting 10 catches for 290 yards and three touchdowns. Junior LB Azeez Al-Shaair is fourth in the nation and first in C-USA in total tackles (123, already his top mark in a season, or 11.2 per game), and is 23rd in FBS in solo tackles (5.5 per game). Then Owls 283 yards per game on the ground is good enough for a sixth place ranking nationally with four of the teams ahead in the count running the triple option - Air Force, Army, Navy, and Georgia Tech. What is everyone doing for the game? I know it's an early game, when means an early tailgate, but come on - the conference championship game is in our house!!! Any way we can join forces, make a good showing, etc? This is amazing turn around after the past few seasons. Getting a chance to grab a conference title after one year with a new coaching staff and probably one of the biggest names in college football as our head coach. We'll be there this saturday cheering them on. Definitely one we'll remember for a long time. I'm flying down from Atlanta on Friday with a buddy (GT grad). Looking forward to a great game. What is everyone doing for the game? Will be in the press box with Jack for this one…once in a lifetime event! If my post says I am "Frank Forte" I am not!! I am a different guest! Back to my post…Have you guys been watching the weekly Inside Burrow tv show that Frank Forte host? It's been amazing. Great interview each week with Coach and then a player bio and then former team member from 2007. If you haven't seen it look for it on Fox Sport Florida. I record it each week. We need to support this program with our viewership. GREAT JOB FRANK! Record and watch every week. lol. lucky. I'll trade you my seats with the drunken idiots behind us. lol. I talked our company into getting the suite for the game, so I'm bringing about 15 coworkers.